How do we climb out of a silence so thick, it binds us? I'm compelled to write this for a variety of reasons. I am deeply inspired by the #metoo movement, incited by a necessity to break the silence that has masked and continues to mask the realities of many women across an array of sectors, from academia to sports to Hollywood. I am also brought back to reality by the readings I'm nose-deep in right now of Rebecca Solnit in The Mother of All Questions. In her chapter on A Short History of Silence, she goes into the ways that woman have historically been silenced (through a refusal of the vote, through legal contracts, through violence and physical abuse, etc.) and how that profusely hinders our freedom and potential for emancipation as women. Finally, I write this because of the physical and emotional liberation that comes along with bringing light, through speaking out, to dark situations. Breaking silence can be empowering and bring agency to the livelihoods of individuals who have been powerless for so long. The beauty of spitting truth to silence is the magical process in which a veil of secrecy is uncovered and a truth, no matter how difficult or uncomfortable or insidious that truth be, is unearthed. 2017 has been a year of silence-breaking, both in the media and news and within the parts of my brain that lie dormant and unstimulated. And so I write in honor of that. My parents can tell you, I've never been one to hold back words, words that I think are painful and incredibly hurtful, but necessary. (Pretty guilty of that this past weekend; we learn and we grow.) As Audre Lorde said in Sister Outsider, "...what I regretted most were my silences." And don't we? Yet in looking at my tendency to speak up in the past, my ambition for the future is to continue breaking the atmosphere of silence that permeates much of society, specifically for women, for minorities and for those who are pushed beyond the margins. That's really one reason, amongst many, on why I created this blog this past summer. To write and create and share and fulfill a space that I did not think was being talked about enough. Of food, food justice, black lives and how black people are affected and implicated by our food options. I hope during this lovely new year, I find the courage bring noise and awareness to hidden facets of life that we either take for granted or do not recognize. And I hope that you will consider doing the same in whatever or whichever arena you're passionate about. Finally, I want to speak to the image chosen for this post; the meaning behind it is incredibly important to me. (I was biking during the summer, and out of the blue, I was drawn to the 33.3 foot-tall silver man I'd unconsciously passed by weekly. I noticed on this day for reasons that had to do with where my mind was; I was incredibly lost, looking to the world for an answer to a life I still have not yet figured out. Like the little... well big silver man.) I chose the figure out of the necessity to portray the fear instilled within us before we decide whether or not to break the silence. 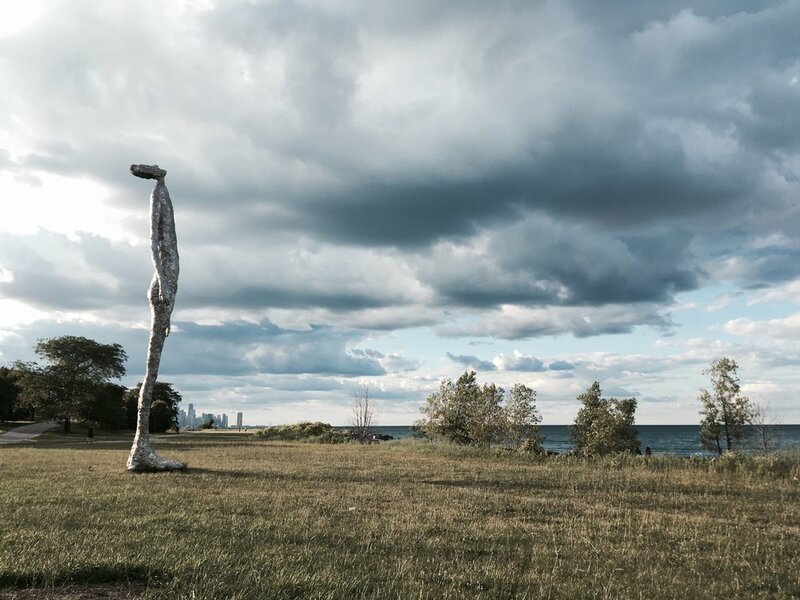 (The piece of art is called "Looking Up" by Tom Friedman located off 48th and Lake Shore Drive, right on the lake-front trail.) What is it stopping us from climbing out of our silence? I feel a sense of contemplation, of calculation, of uneasiness. I still feel that fear, in creating words and projecting them out into a universe to be critiqued and judged. I say all of this to say, we must continue to break the silence. To answer the title of this, How do we climb out of a silence so thick, it binds us? You just do it. In what ways are you silenced? In what ways or you biting your tongue against sounds that have the power to liberate, advocate for or transform society? P.S. Written at Philadelphia airport off 3ish hours of sleep. Excuse the haphazard way in which these paragraphs were crafted. I try, I try.